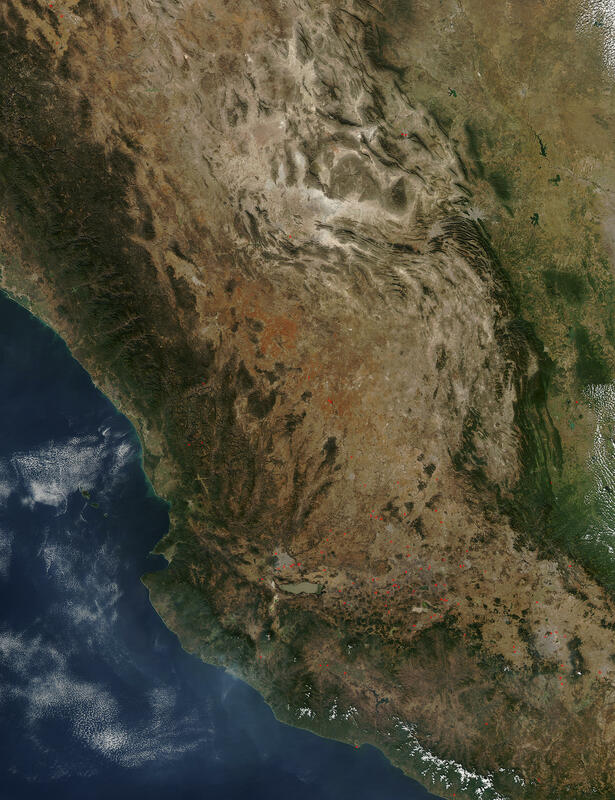 The two arms of the Sierra Madre Mountains — Occidental (west) and Oriental (east) — march south through Mexico, holding between them the high, largely arid Mexican Plateau. This plateau is roughly 1,130 kilometers long (~ 700 miles), and ranges from 1,220 to 2,440 meters high (4,000 - 8,000 feet). What water there is on the Plateau has no outlet to the sea, and so collects in drainage basins that today are the home of a number of Mexico’s major cities. A number of large cities are visible in this true-color Aqua MODIS image. About 75 kilometers due east of the group of fires in the upper left corner is the city of Chihuahua, which perches on the western side of the plateau near the Occidental range. On the opposite side of the plateau and about 550 kilometers southeast, two cities face each other from opposite sides of the Oriental range: Saltillo (west) and Monterrey (east). At the southern end of the plateau, a number of cities can be seen. The large grey dot north of Laguna de Chapala is Guadalajara, one of Mexico’s foremost cities. In the lower right corner of the image is the capital itself, Mexico City. Scattered throughout this image from December 22, 2003, are a number of fires (marked in red). Southwestern Texas is visible in the upper right corner of the image, while the Pacific Ocean occupies the lower left.